Have you experienced the thrill of White Water Rafting yet? Well it's nothing to be scared of that's for sure! Our fully trained and qualified instructors are always on hand. After a safety briefing and warm up games you will experience a fun session of White Water action. Photos will be taken and emailed to you at the end of your session! Bala, Llangollen, Llandysul or Cardiff? Prices include all equipment hire (wetsuit/buoyancy aid/paddle/helmet) and full instruction and guiding. Rafting is suitable for those aged 12+ and customers must be able to swim. Under 18 year olds must have signed consent of an adult. All staff are of course fully qualified and experienced. Once you have booked we will email you a full itinerary with directions and kit list (swimwear/trainers you don't mind getting wet/towel). 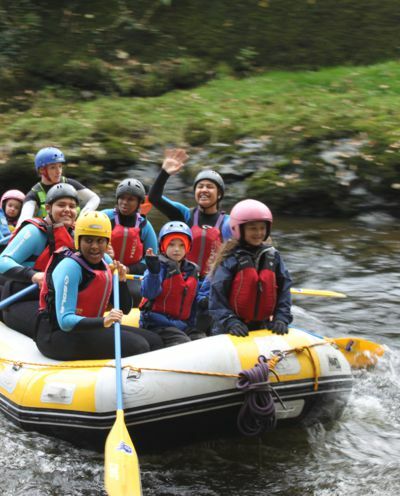 If you are travelling all the way to Wales for the weekend, why not combine your Rafting trip with another fun activity? Our friends at www.comeandtry.com offer a great range of adventure activities to keep you out of trouble - give them a go! They also sell vouchers valid for 12 months, great for Christmas or Birthday presents. Or try the legendary Shaggy Sheep Wales Coasteering.